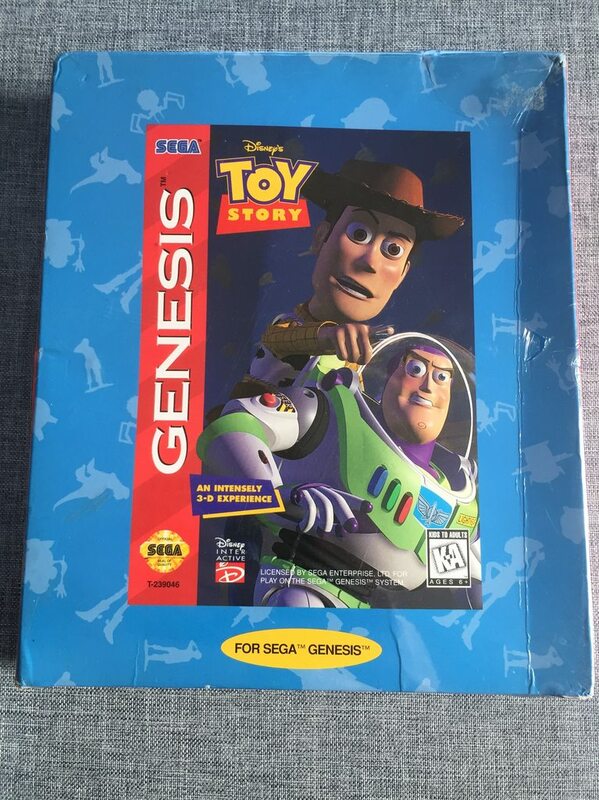 Toy Story Sega Genesis Big Box Anyone have any info ? 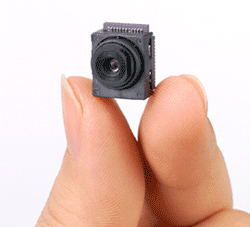 Display Only, Something else ? 1. Has anyone seen this before ? 2. What do we think it is, a display only box, some type of limited pack, etc. ? Wow. I figured it was a retail's store way to repackage a loose game. I would believe this but the side looks too legit. That's crazy. Would love to know more about it. Check the contents. Is the game cart any different? Manual? I only found the empty box. Nothing inside it. It is very well made and printed. It appears that everything except the blue matches the regular size release of the game. T-239046 on the alien side matches the assembled in USA Cardboard normal size box that I have (From a different purchase) The normal size box I have is the slideout cardboard kind. The UPC & ISBN are different. The inside of the box is white. I would guess it was a store display. Although if it is it is a pretty stupid one as you'd think they'd have a little spiel or something about it other than just the picture of the box on a bigger box. Almost as cool as that Bevis and Butthead bigbox minus the t-shirt and poster. Who knows it may have had some goodies stuffed in there at some point. I've seen it before (maybe eBay?) but I don't have any further information. Ditto, I have seen it before but never with any additional goodies, I have a feeling it was a Disney World exclusive box. I cannot confirm this but pretty certain. Great item either way. I've posted some pictures from the one I had purchase last year. As expected nothing but the game!!!!! Still a bit of a mystery. Haha, it took over four years to find out what was within. Definitely better late than never. What an anticlimactic post that was. So it's just the regular game in a bigger box? Dyer, where was the seller located? I must say, that's a bit anti-climatic, but the good news is Everharm should be able to complete his empty box very easily. Based in the US. Got a cheap BIN price on it $18.99, shipping was more expensive! @nieds16 You are right a complete anti climax but good news for pepole looking to complete a copy. 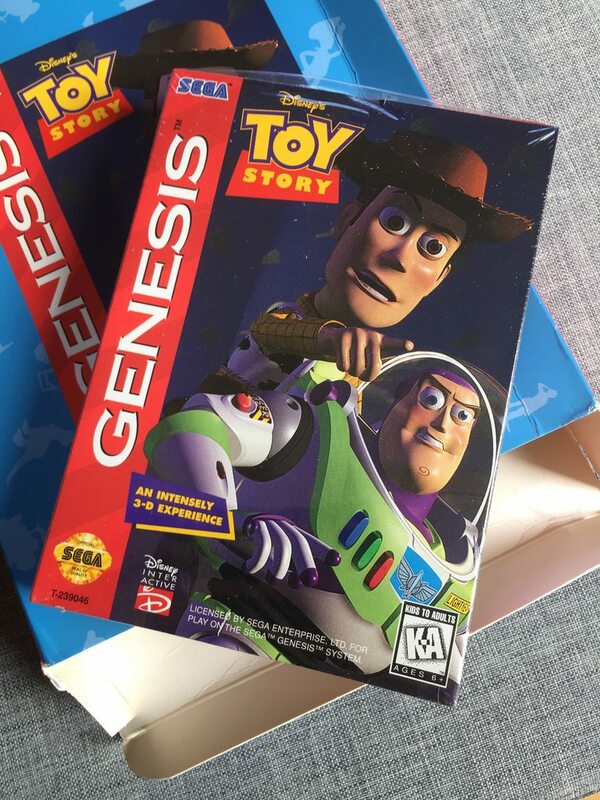 Hey Dyer, can you help me figure out which version of Toy Story was included in the big box? Now that you, Everharm, and Johnny all have a copy, I've added it to my spreadsheet, and it happens to be the 6th (!) Toy Story release I've recorded. But I suspect this "6th" release contains one of the other 5 releases. Can you tell if it is a flip top or slide box? My guess is that it would be a slide box. And then if it doesn't have a Ballistic sticker on the back then its either the 1st or 2nd release in my spreadsheet. And the only way I know how to tell those apart is based on the instruction manual. Can you tell if it is a flip top or slide box? Is this what the kids are calling them these days? Back in my day we never had any of this mumbo-jumbo nonsense. Yeh sure, it's a slide box, no Ballistic sticker and the manual has a colour cover. Any other details you need? I could get some pics if you need them. Oh did you open up the game itself too?? No I also own a 2nd big box open copy which is mint. I have kept this game sealed. So my report was based on the other, although to be a 100% sure I suppose the only real way to confirm is open the new one! Heh, I'm sure that the report from your other big box is sufficient!